Doing anything exciting this weekend with the family? Or want something different to do with your mates on the Sabbath? 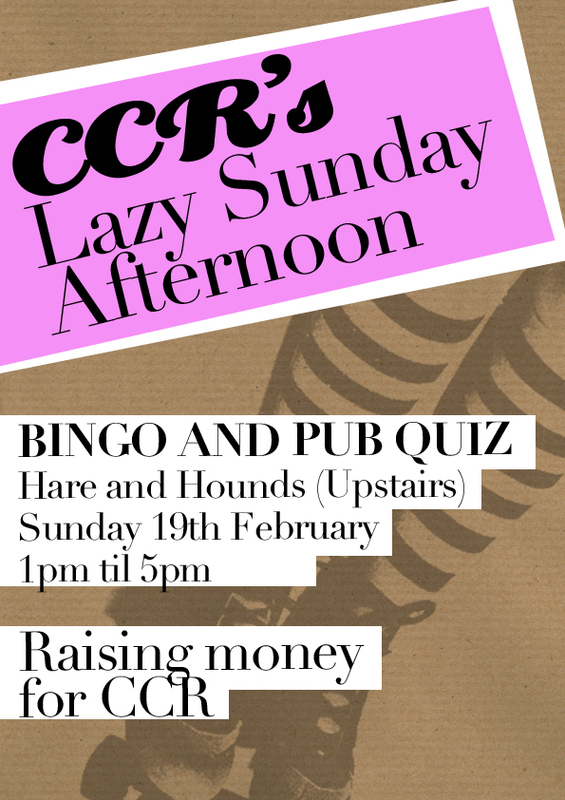 Why come down to the Hare and Hounds (Kings Heath, Birmingham) and join in with CCR’s lazy Sunday afternoon? CCR is raising funds to help the Slay Belles travel to Ireland in May to play Dublin Rollergirls. Trips are self- funded, so skaters, coaches, refs and NSO’s depend on fundraisers like this event to help them get around the UK. The day kicks off at around 1pm with a game of Bingo – The Incredible Hulse is in charge of unorthodox calls, with her lovely assistant Rubix Crude. That’s followed by a quiz – with the usual rounds plus some awesome challenges, so you can still gain points if you can eat a donut quicker then anyone else in the wild, wild West (Midlands). Children are welcome, tickets aren’t necessary, so just come down on the day and join in – it’s the perfect way to spend a Sunday afternoon with friends and family, and help CCR at the same time. Directions to the Hare and Hounds can be found here.